When I say I'm in love, you best believe I'm in love, L-U-V! 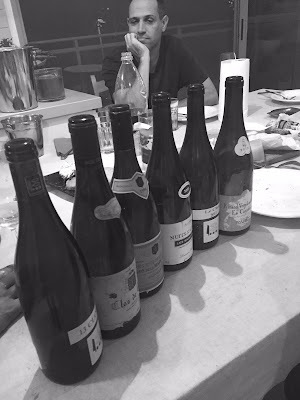 This one night - there was no unifying stylistic theme to the wines. One was a dud, another was outright weird, a wine that made no sense at all in the context of Bourgogne as I know it. It wasn't really a great tasting, but I came away thinking, "I just love this stuff" and "I'm such a lucky guy". I never knew, never suspected, that somewhere in the Cote de Beaune, there lurked such repugnant evil, infiltrating the heart of a venerable producer, and in the dark abyss of human hubris, bringing forth so foul a beast: an orange wine from Ladoix. Supremely interesting, in an arch way, flicking its demonic scents like a Pinot with stink. This hails from the Mugnier monopole, predating the domaine's taking back control of the family plot. Based on Faiveley's (mis-)treatment, this doesn't deserve a premier Cru designation. It's ripe, extracted, odd, with dry tannins, recognizable as Pinot, but just barely. This, however, is a true Premier Cru, right up my alley, too, with leather, earth, languid fruit, and tasty acidity. More feminine than I expected, given my past experience with Gouge's Premier Crus. Excellent. Burgundy Wine Collection, about 350 NIS at the time, it's almost twice the price these days. Complex, animalistic, with a touch of rotting leaves. Deep, yet still undeveloped. When will the great 99's peak? I'm willing to forget the curious incident of the orange wine in order to mark this as my first encounter with Prieuré Roch. A certain type of ripe Pinot can be great if it's also languid and juicy enough, with enough sublime purity. It's called magic. This is such a wine and while it's only a village and shows it, it's pure magic all the way. Burgundy Wine Collection, 320 NIS. About three or four years ago, I was running into so many oxidized white Bourgognes, that I was ready to forego any further purchases. Which would have broken my heart, as the genre ranges from salivating on the lower end to deeply moving at the top. But it seemed a risky prospect, until Daniel Lifshitz and the Bourgogne Crown came along. Daniel can sure pick 'em, and as he picks them lean and mineral, I loved them young, and their aging curve so far has renewed my faith. This is a lovely example, indeed, of a young B white, offering freshness and minerality, with a trace of the Corton fat. A steal at 270 NIS.